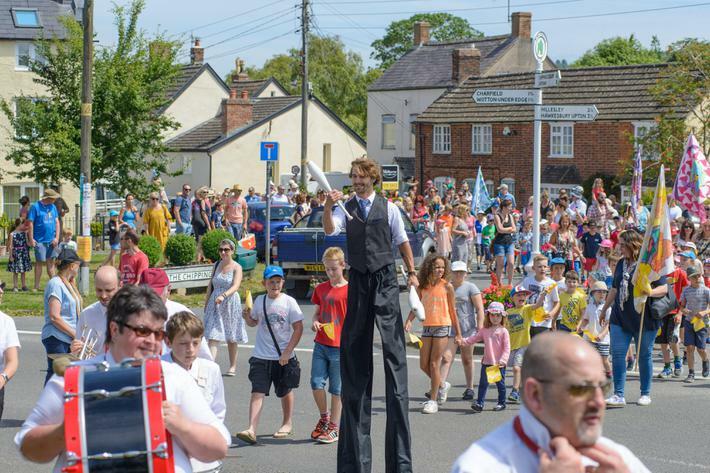 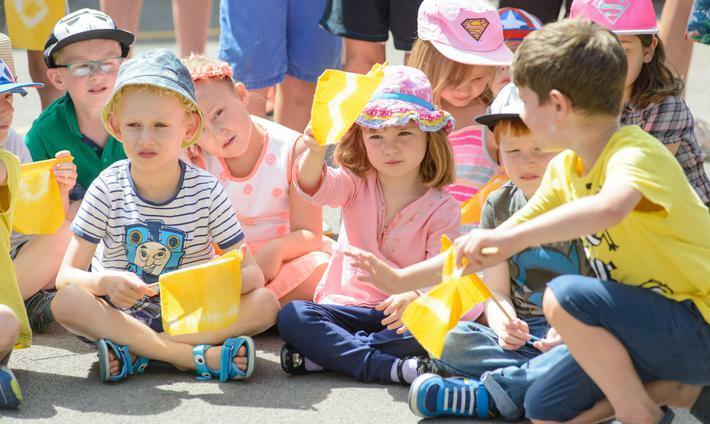 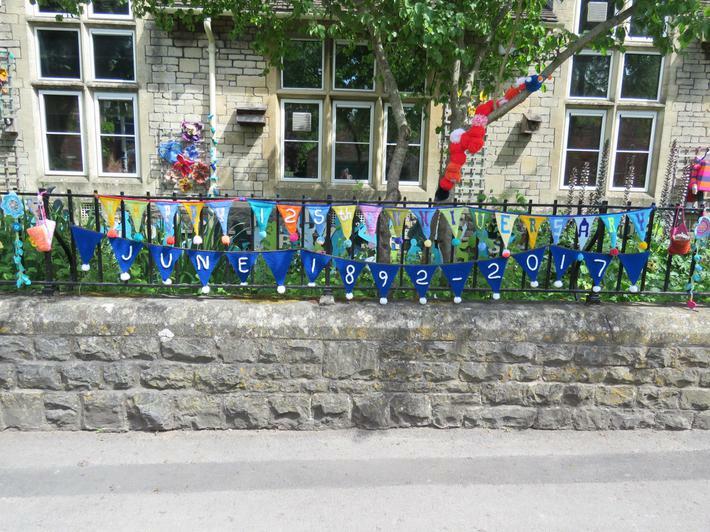 On Saturday 8th July we held our celebrations to mark the 125th anniversary of the school's foundation in 1892. 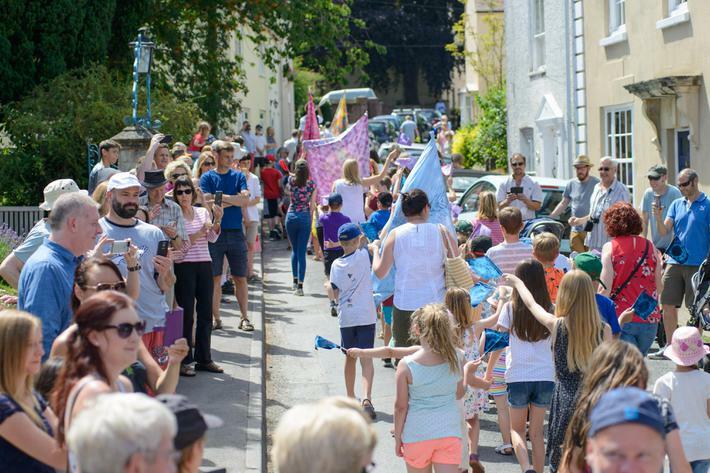 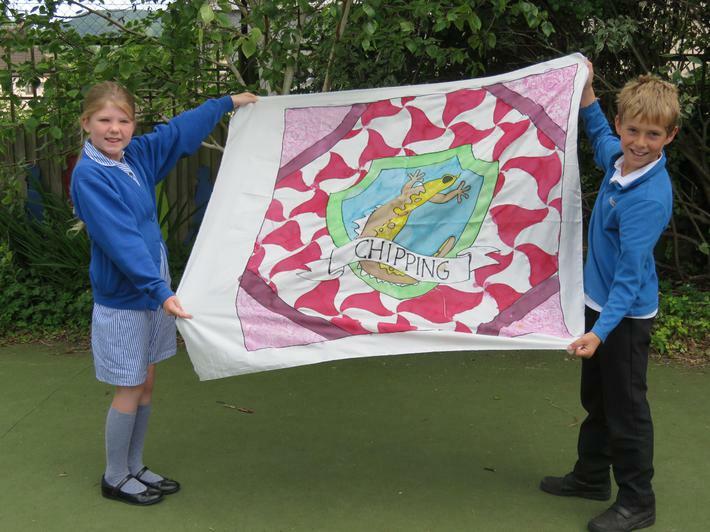 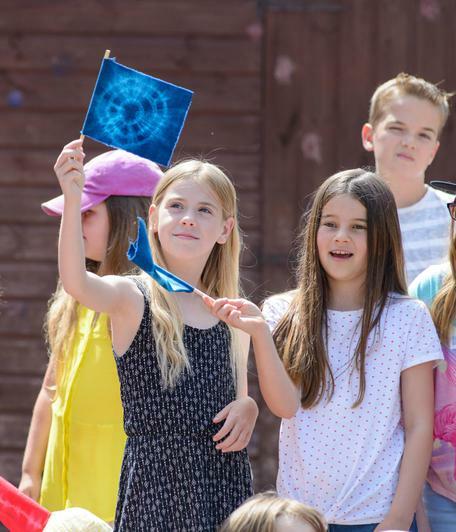 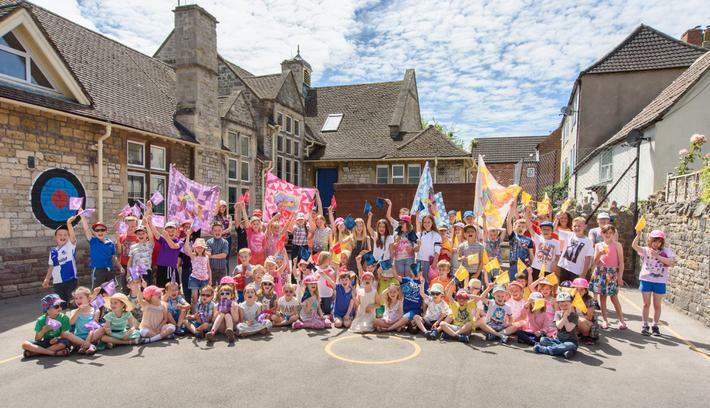 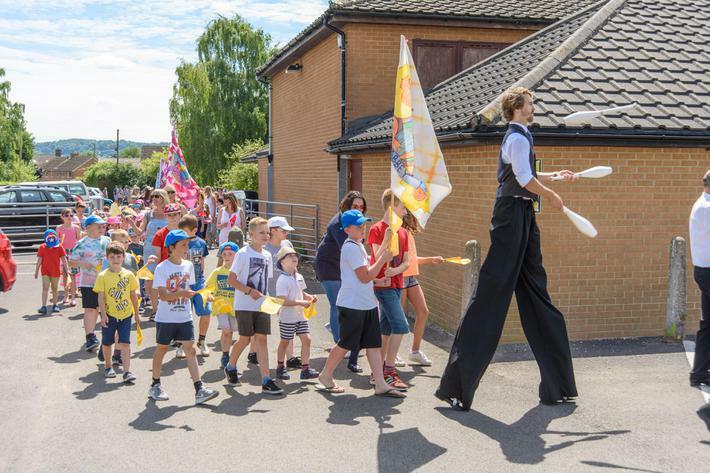 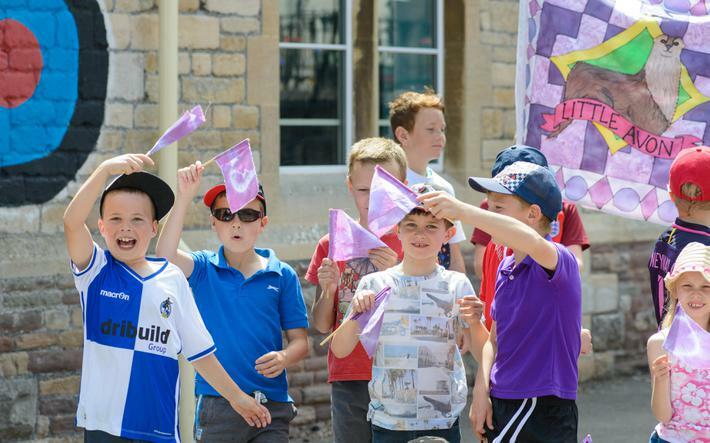 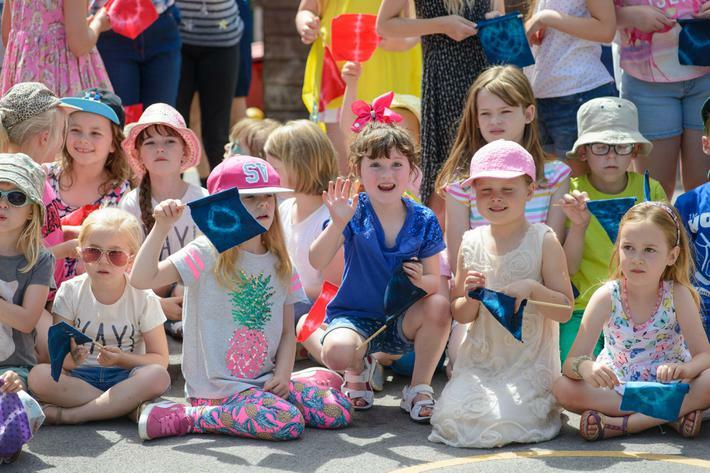 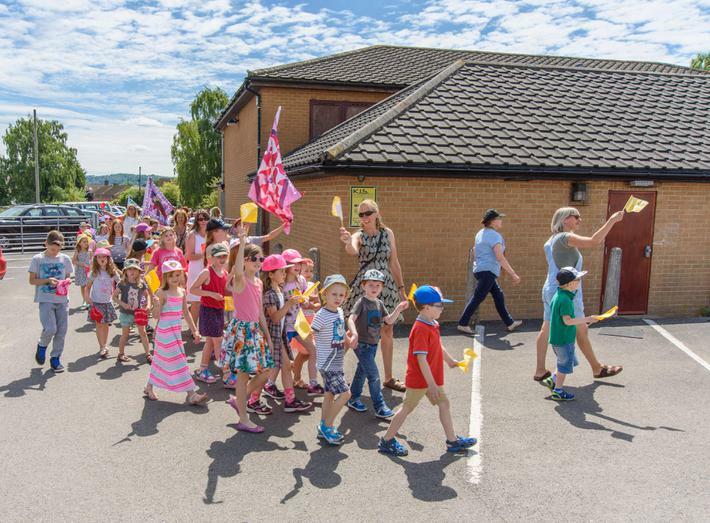 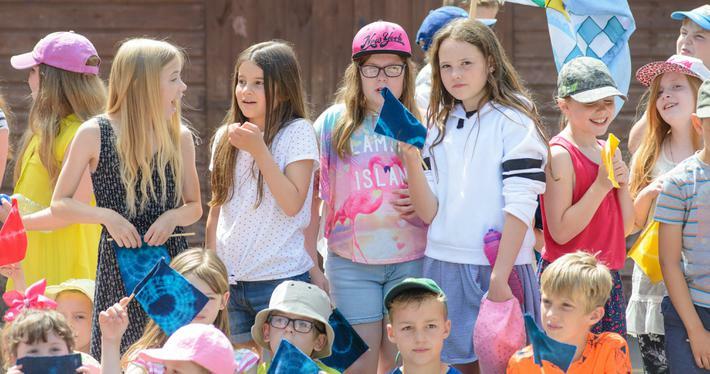 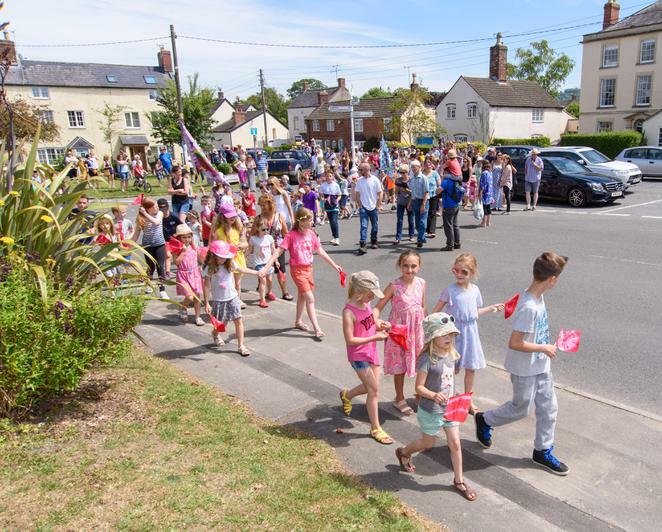 We paraded from the school to the village playing field waving the new house banners and our individual flags that we had made with artist Nicola Davies (see below for details). 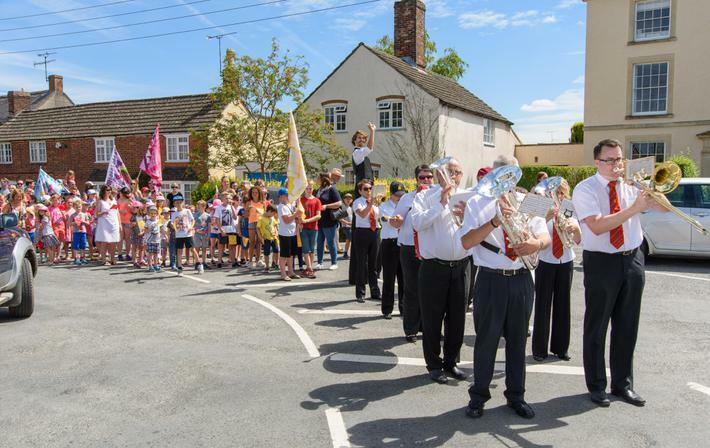 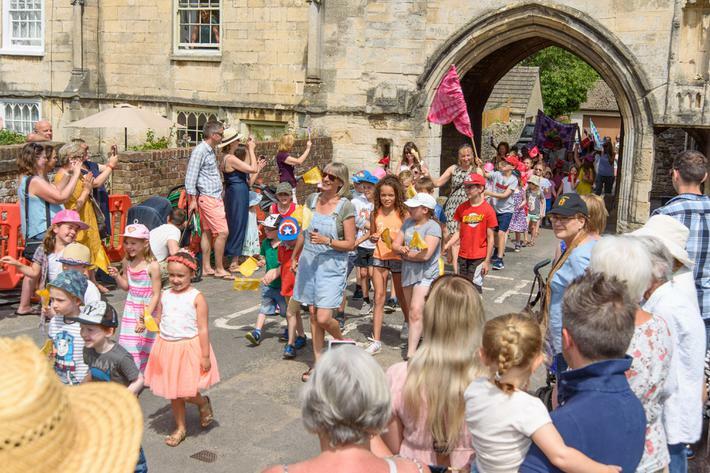 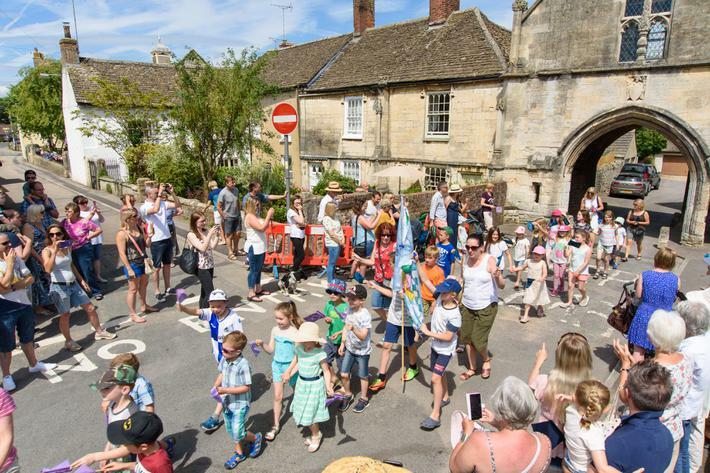 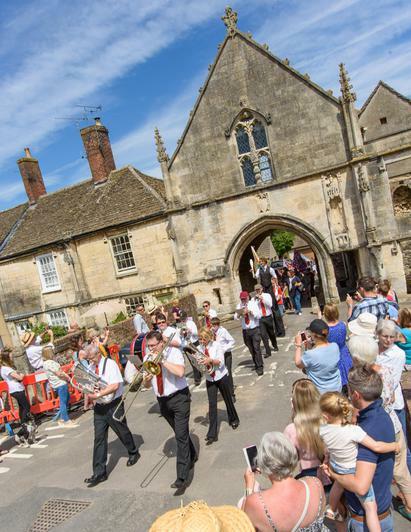 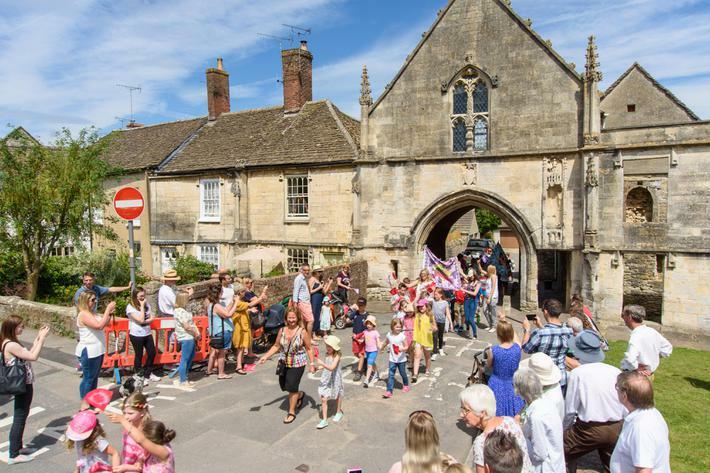 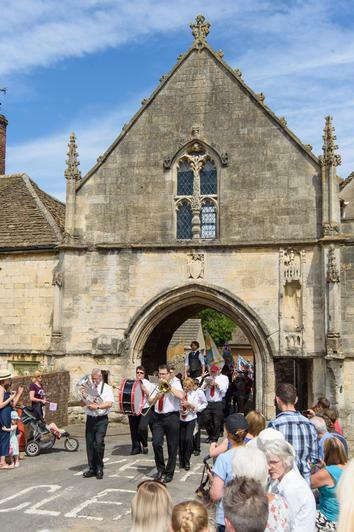 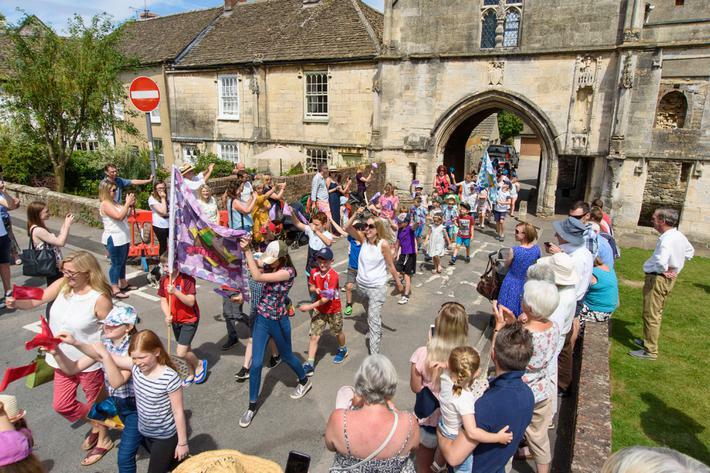 We were accompanied by Wotton Silver Band, who were previously known as the Abbey band (and have our village's abbey archway as their insignia). 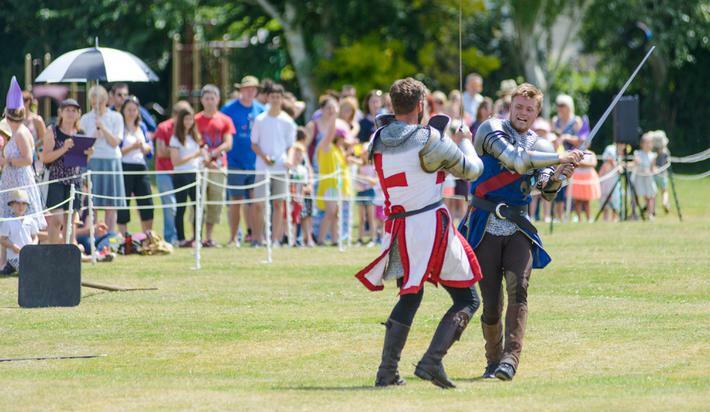 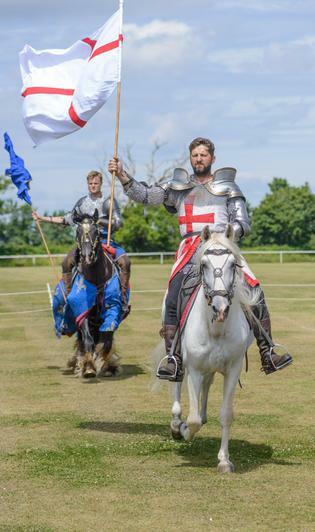 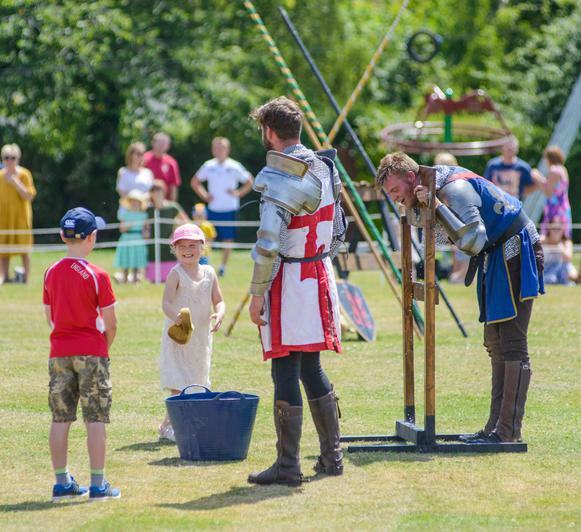 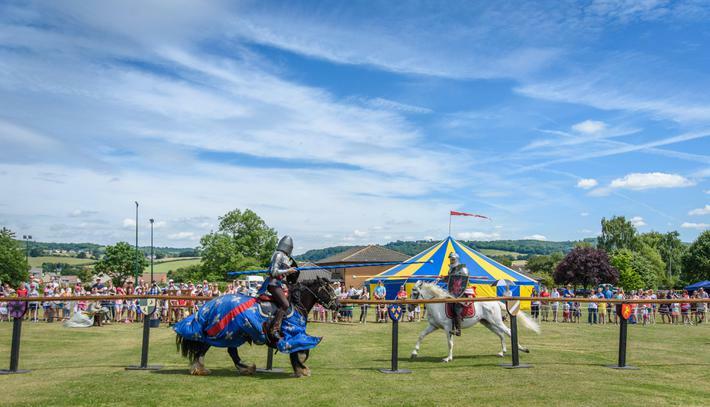 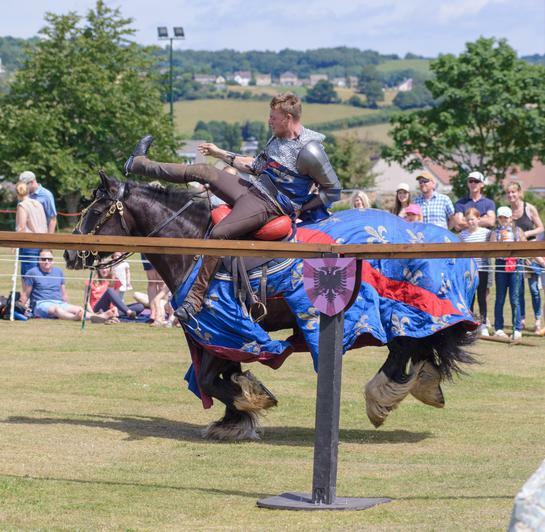 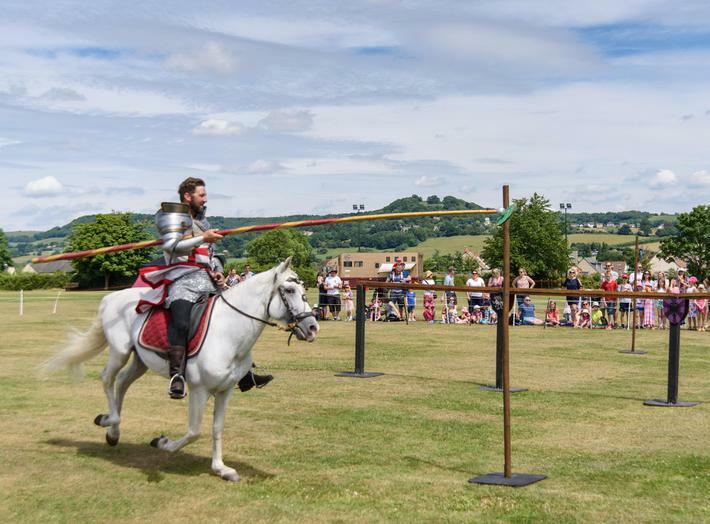 At the village playing field we were entertained by the Heroes of Cavalry jousting display team, as well as shows by Circus Sensible. 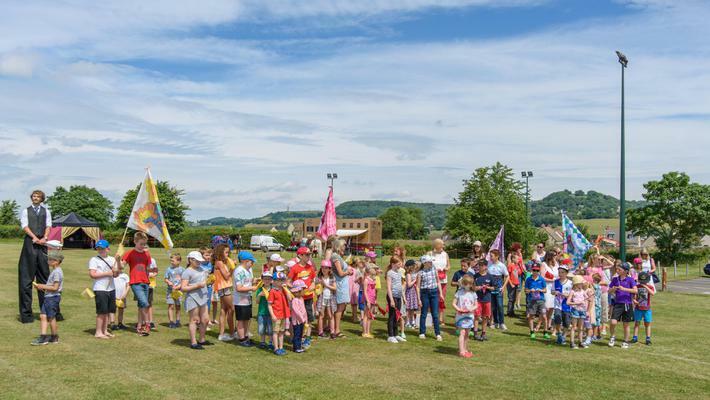 Tug-of-war, stocks, a hog roast and craft activities from the KSA (as well as delicious cakes baked by the staff) made it a memorable day! 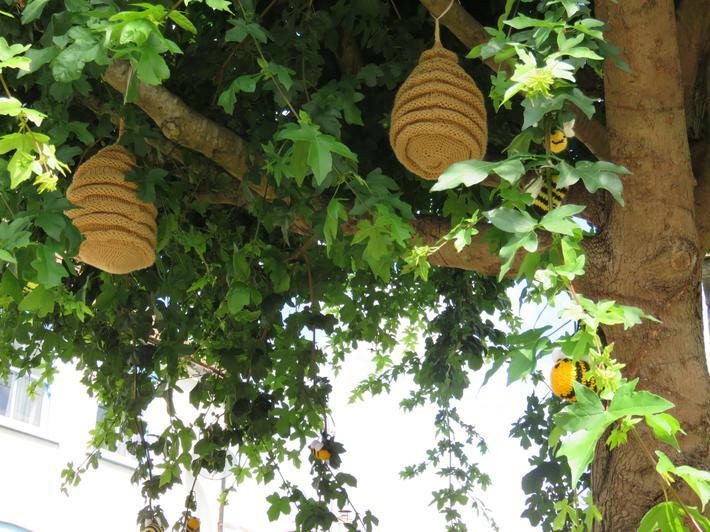 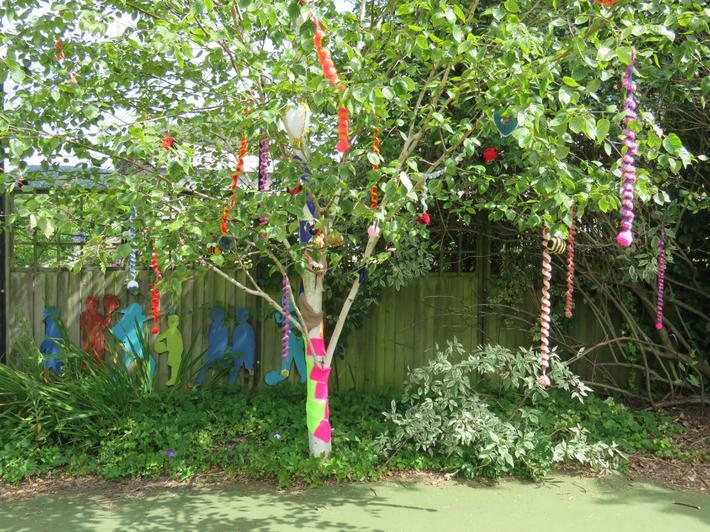 This half term our school grounds have been transformed to celebrate our 125th anniversary as a school. 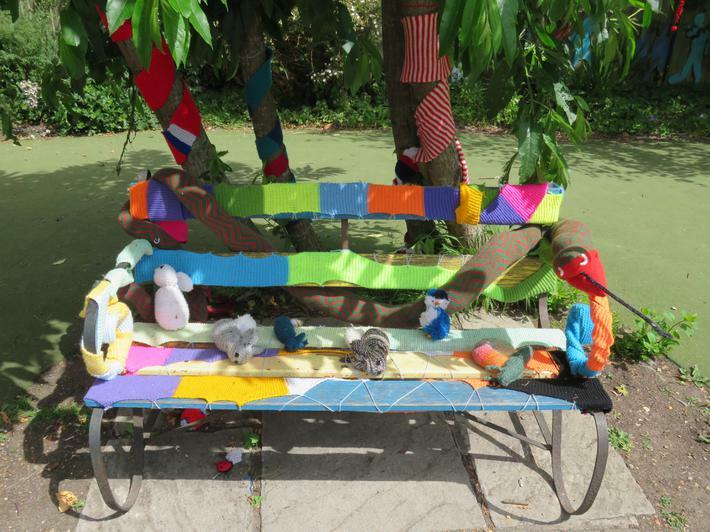 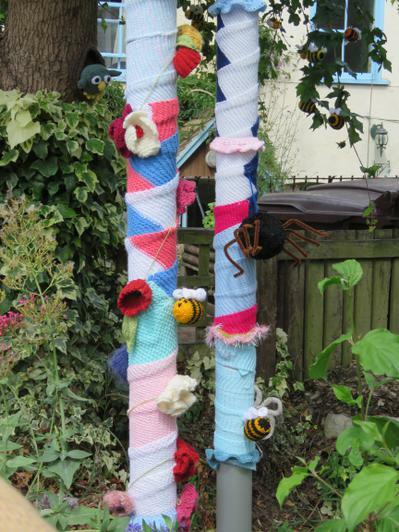 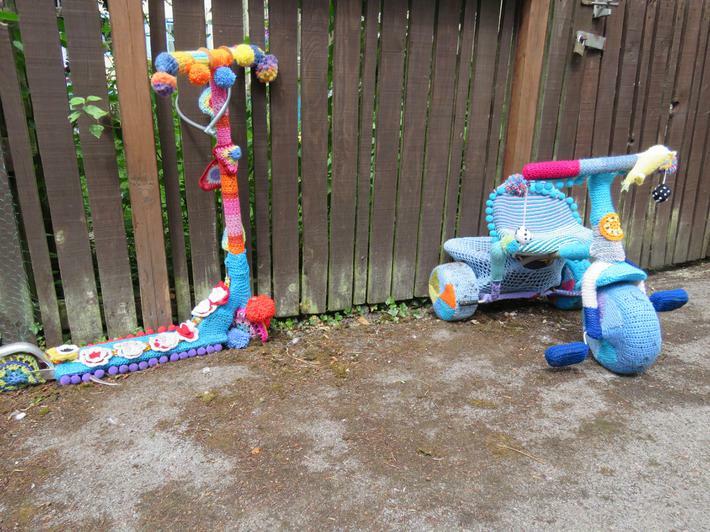 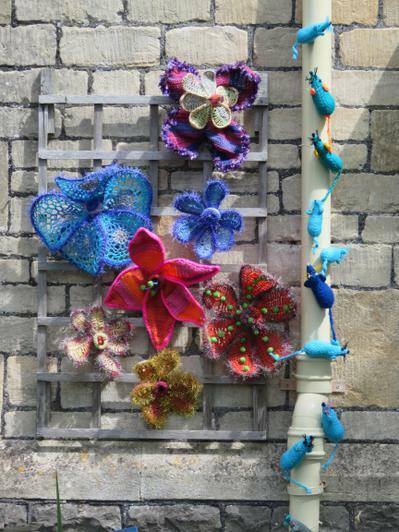 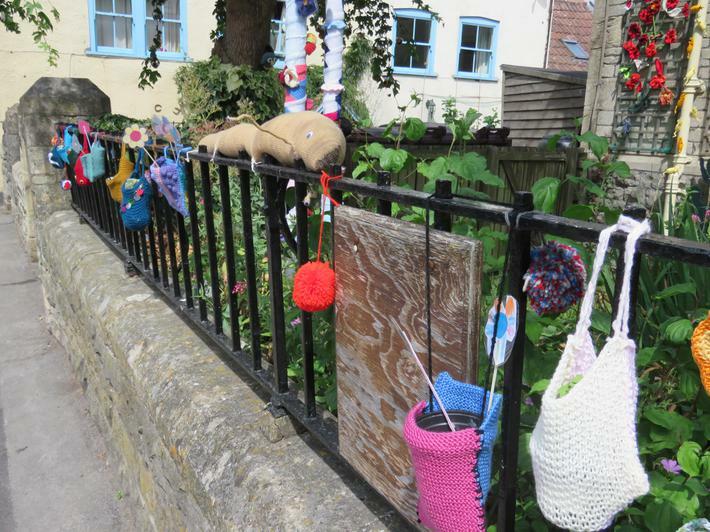 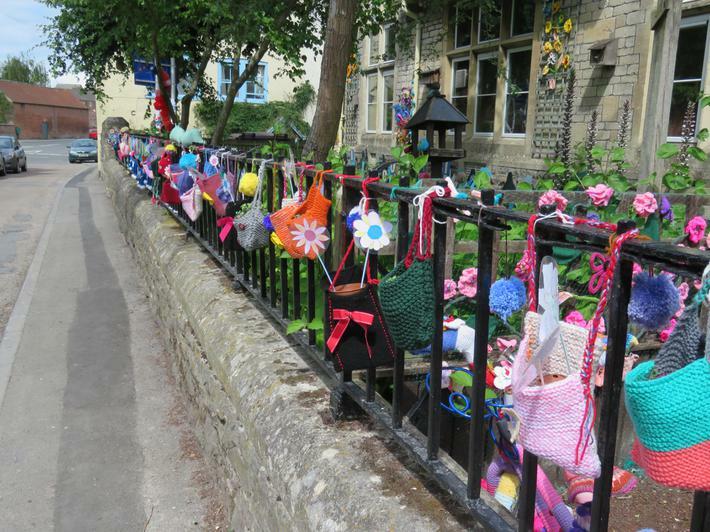 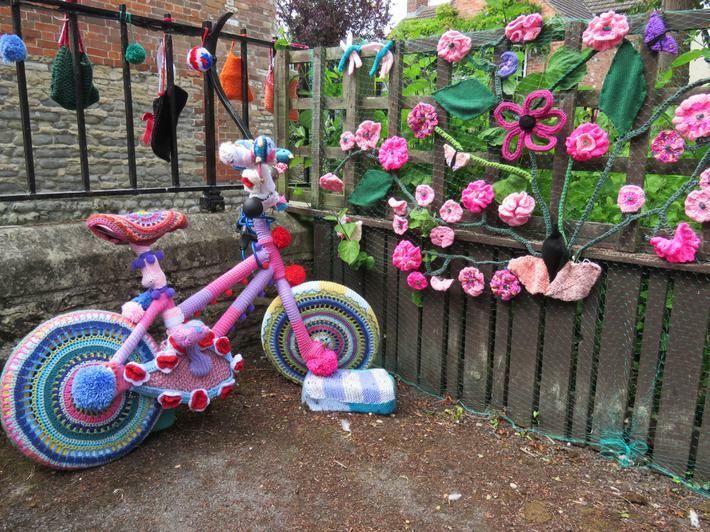 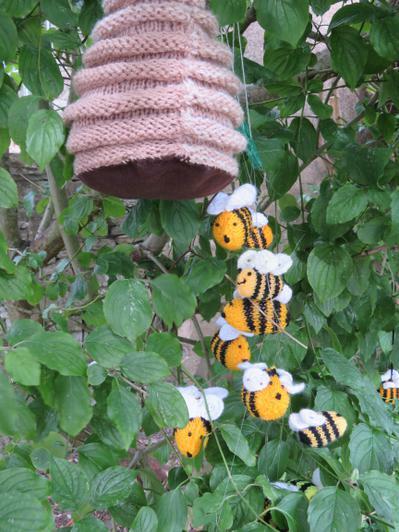 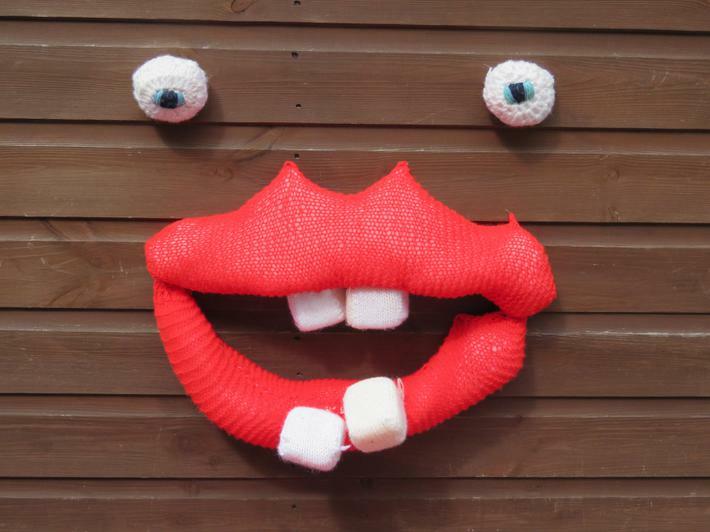 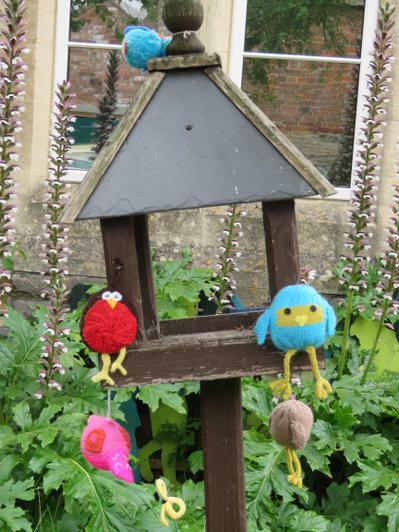 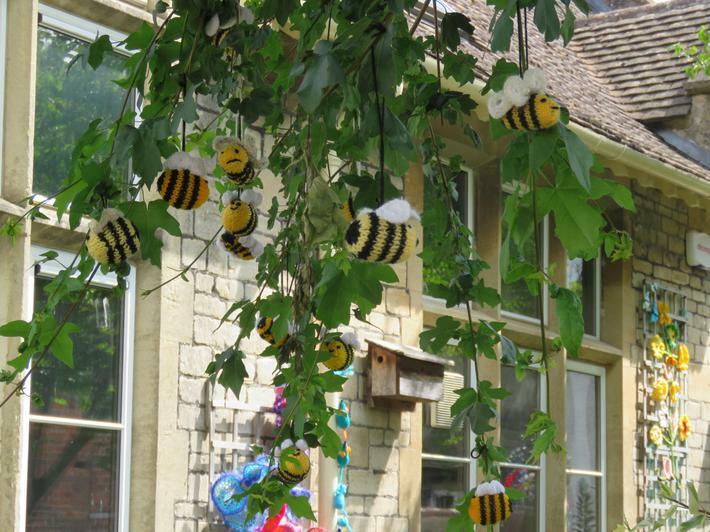 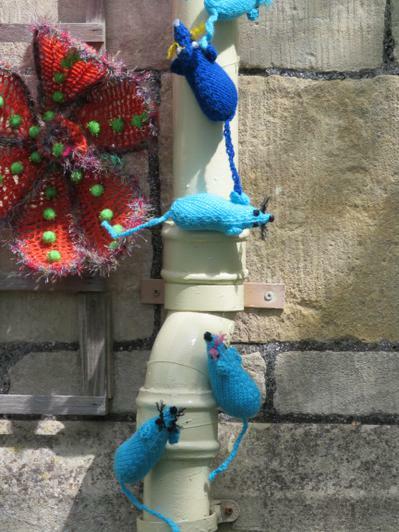 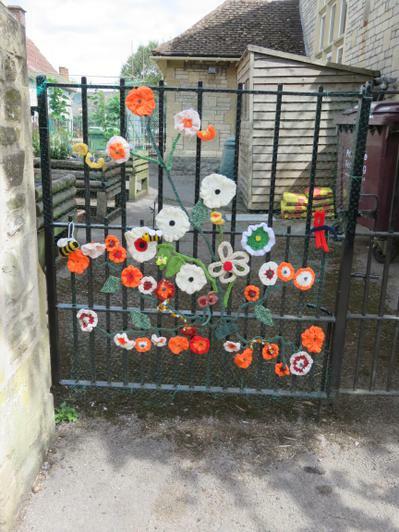 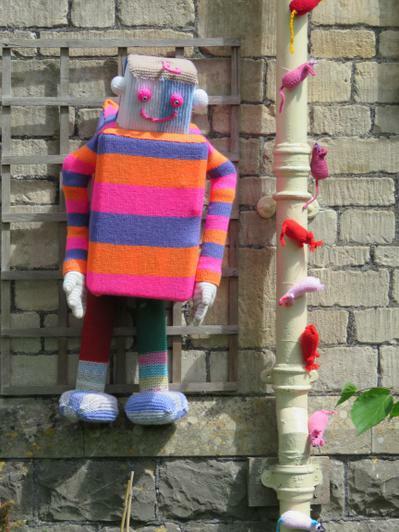 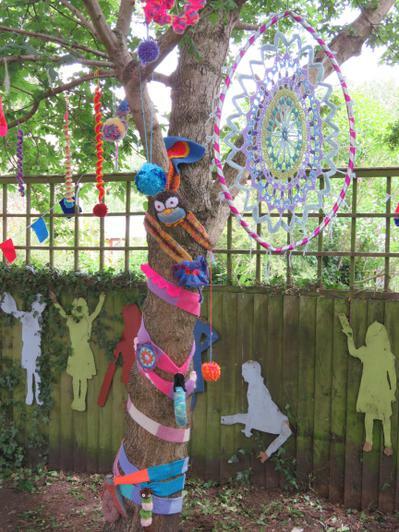 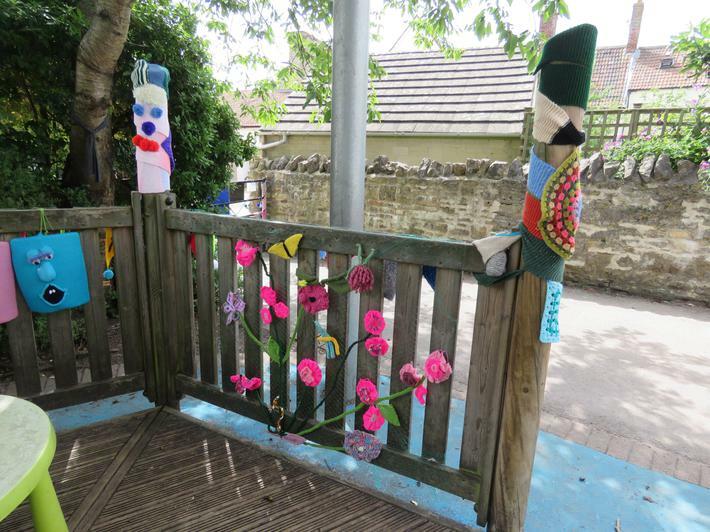 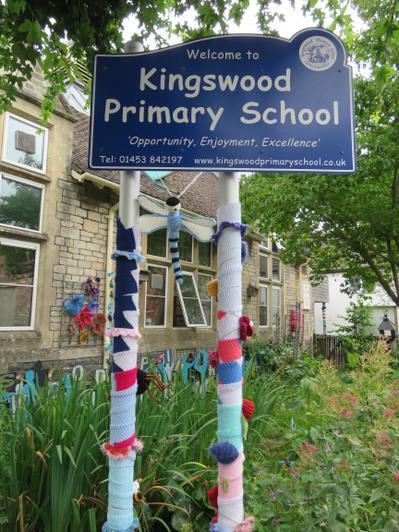 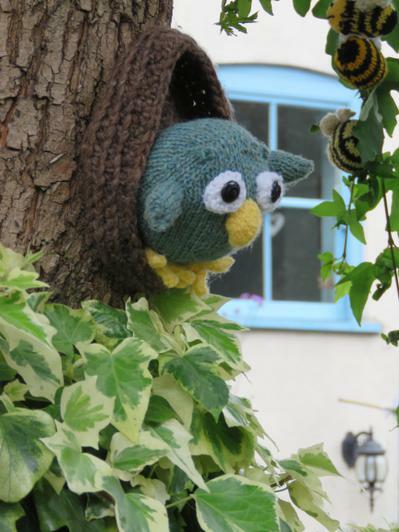 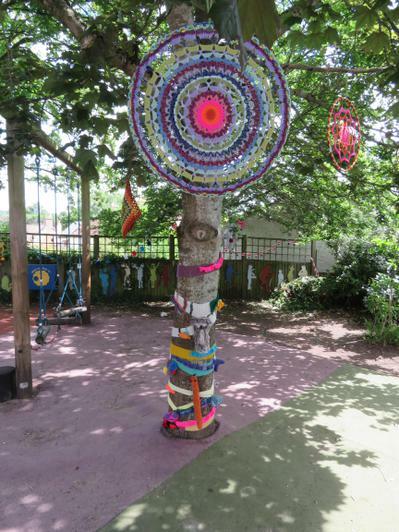 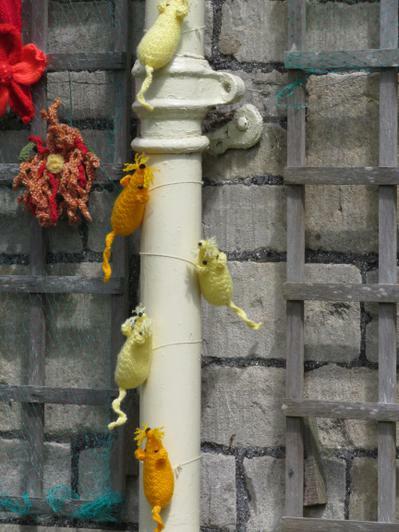 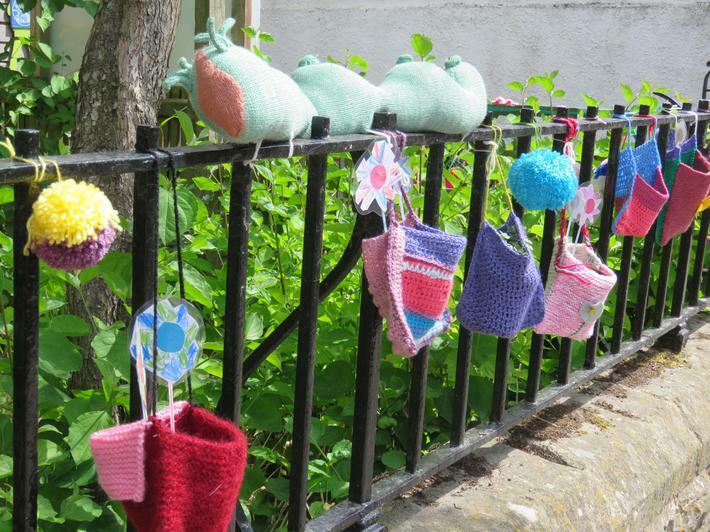 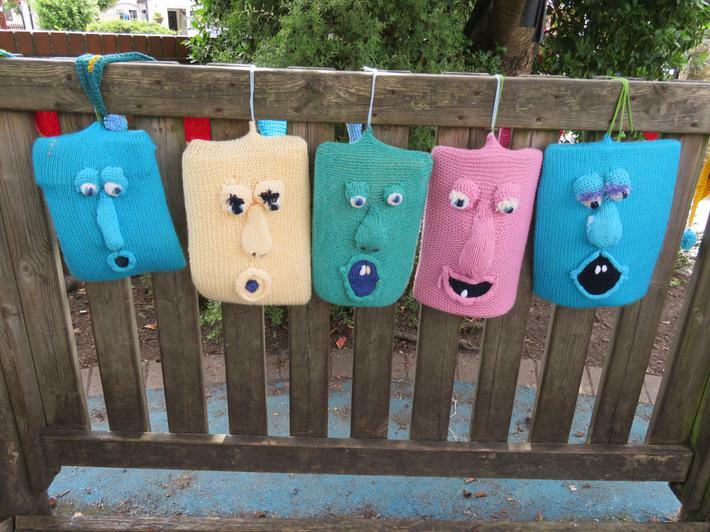 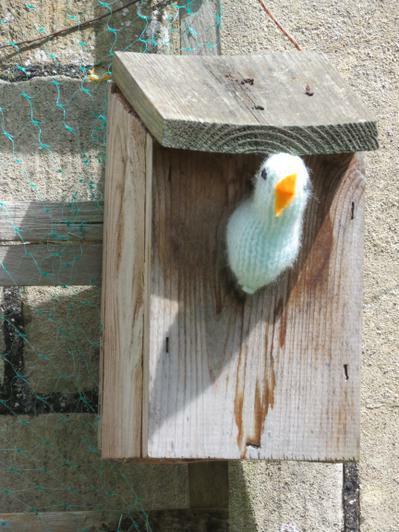 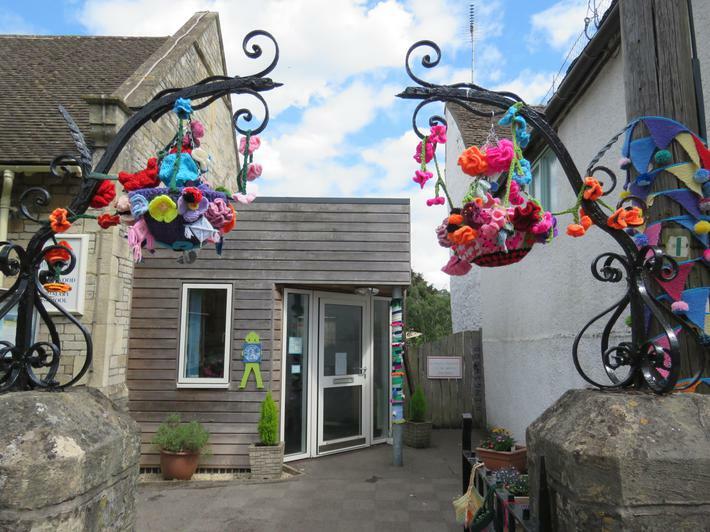 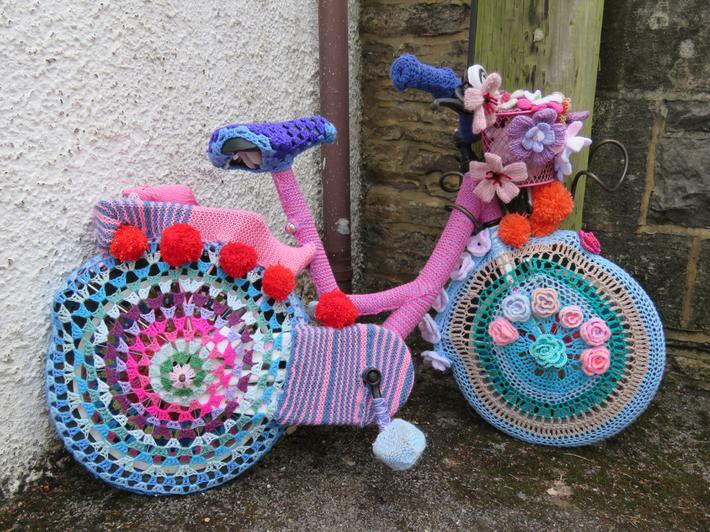 Festive bunting, flowers, animals, insects and a wide array of decorations have popped up in our front garden and in the back playground - we even have a yarn robot! 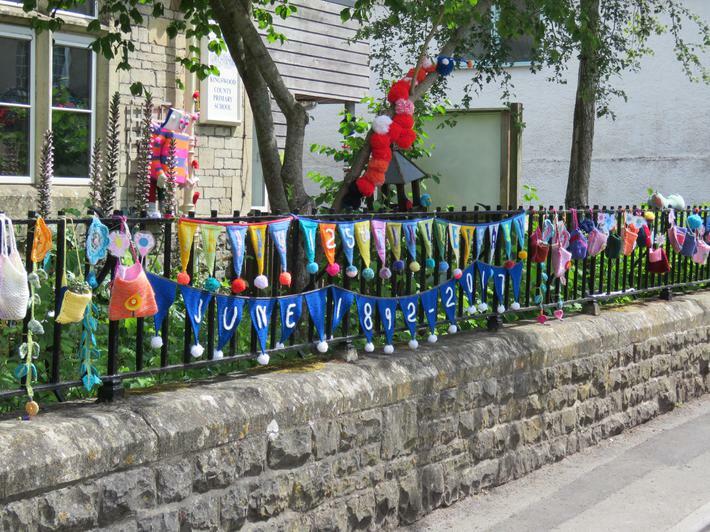 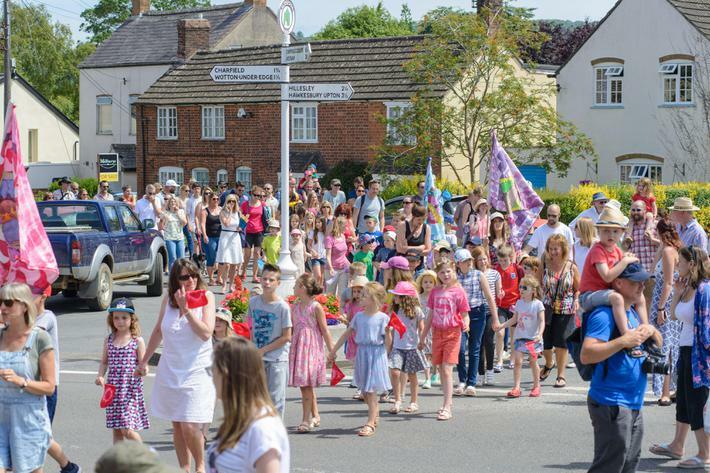 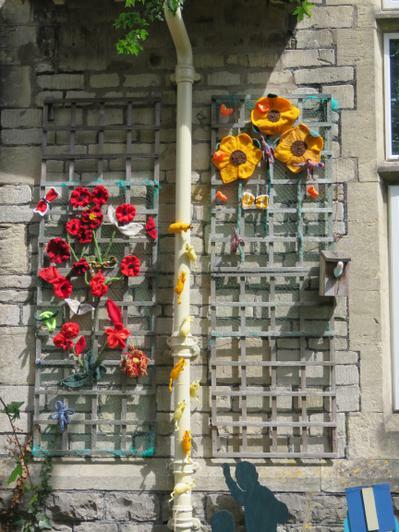 Many thanks must go to Mrs Coatsworth and the team of talented volunteers from the village for their many hours of work, which are giving all of us a great deal of pleasure as we see new things each day! 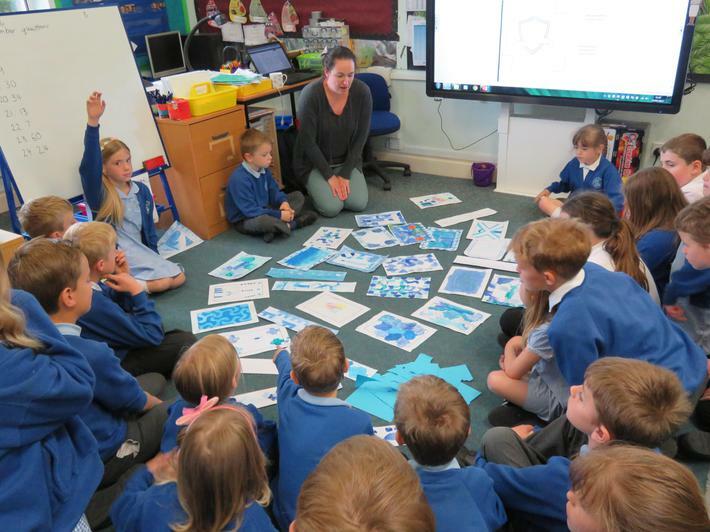 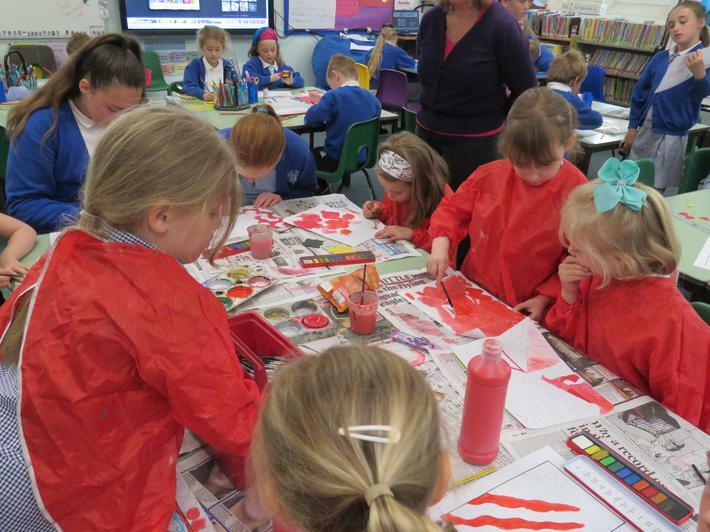 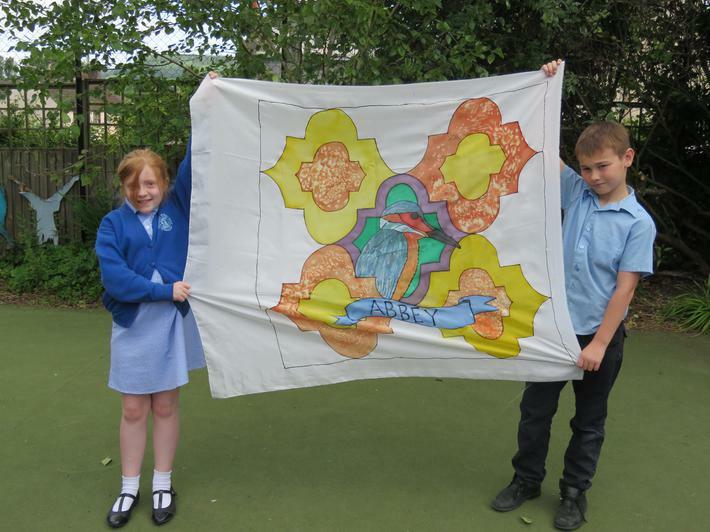 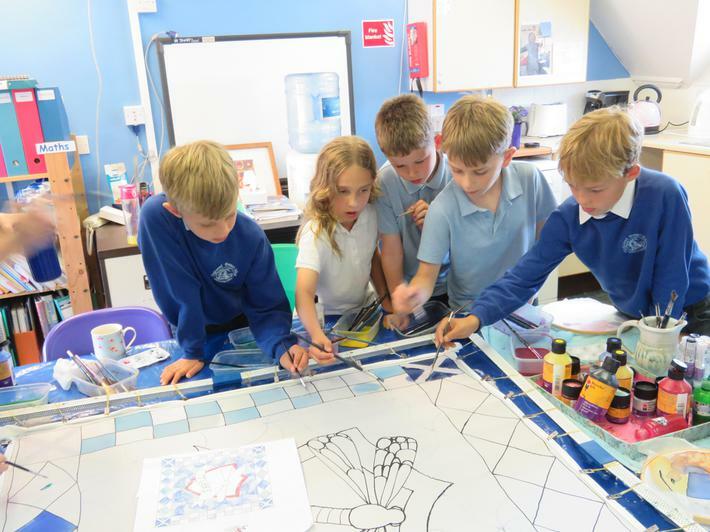 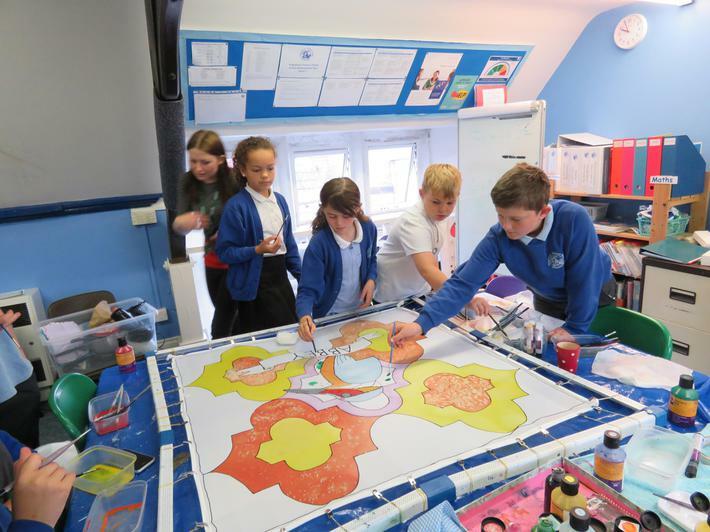 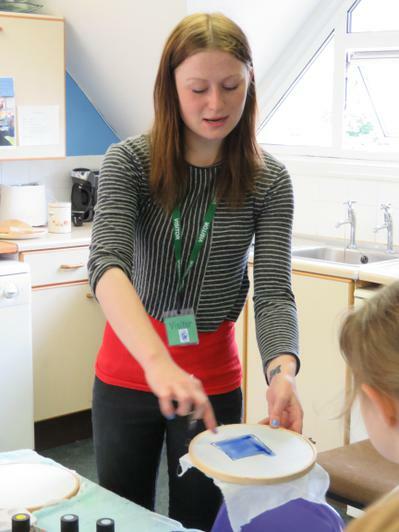 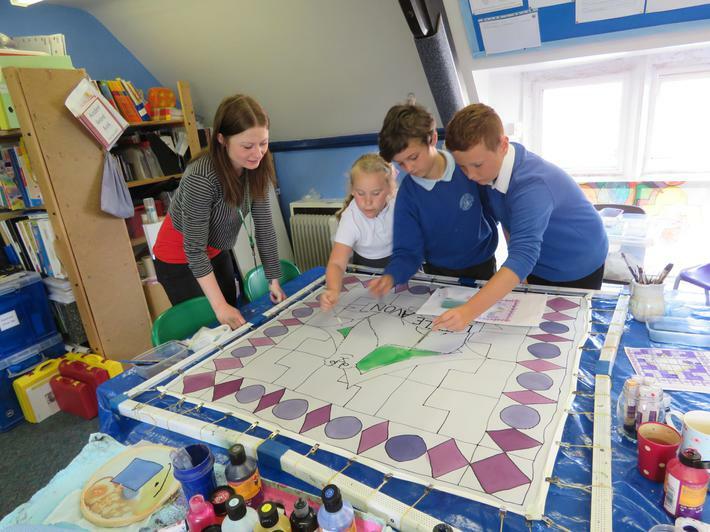 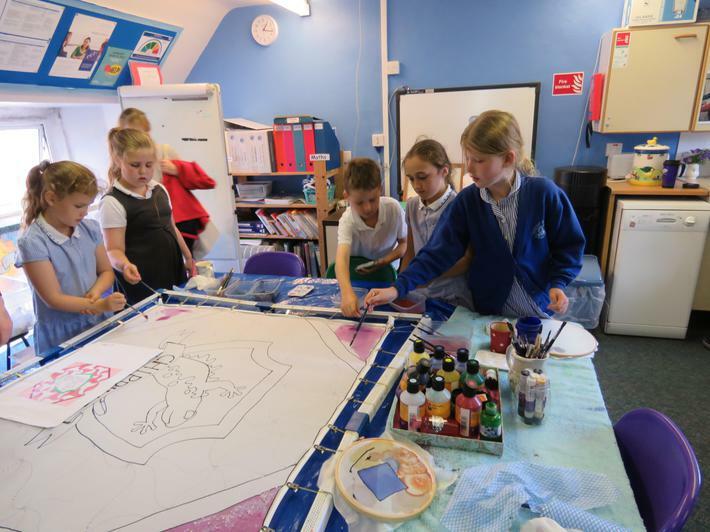 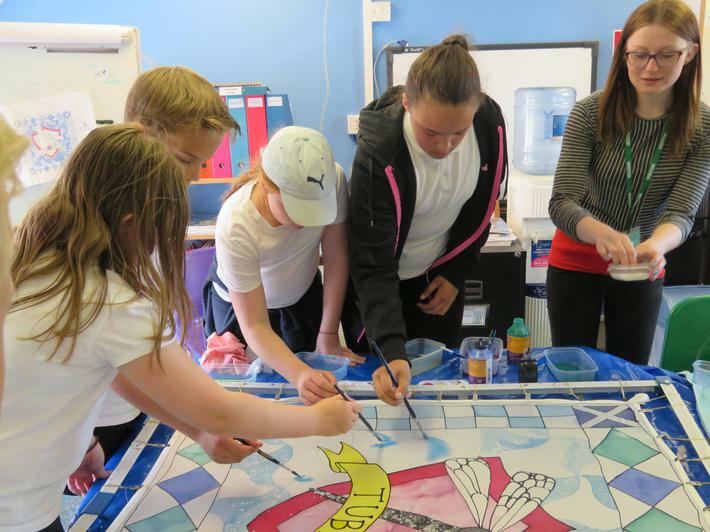 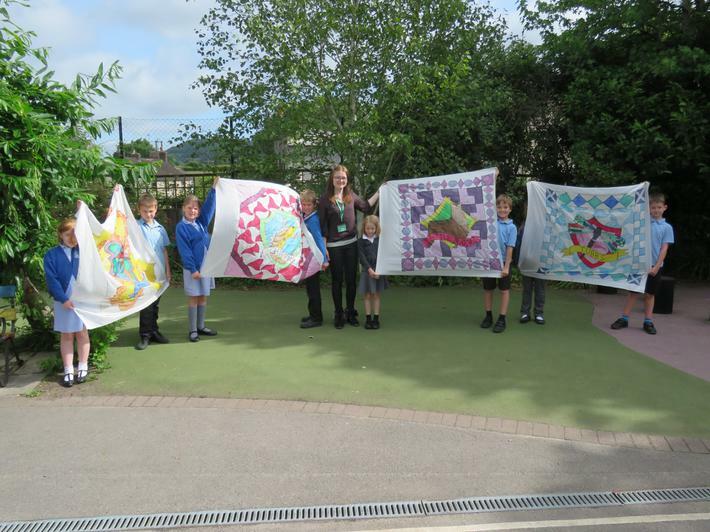 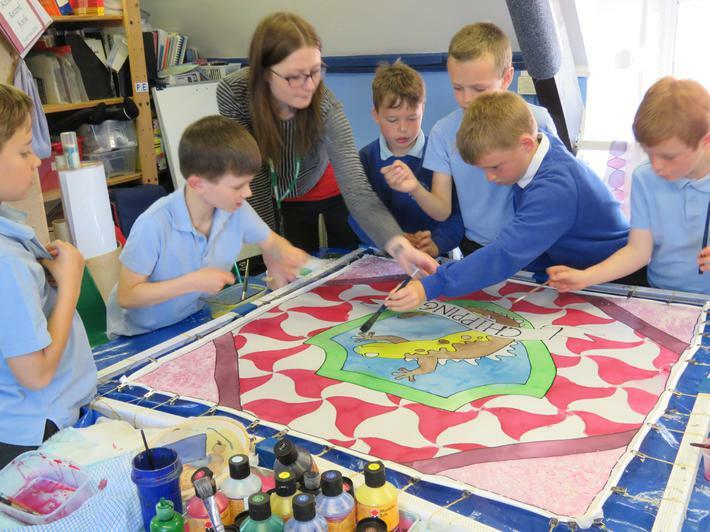 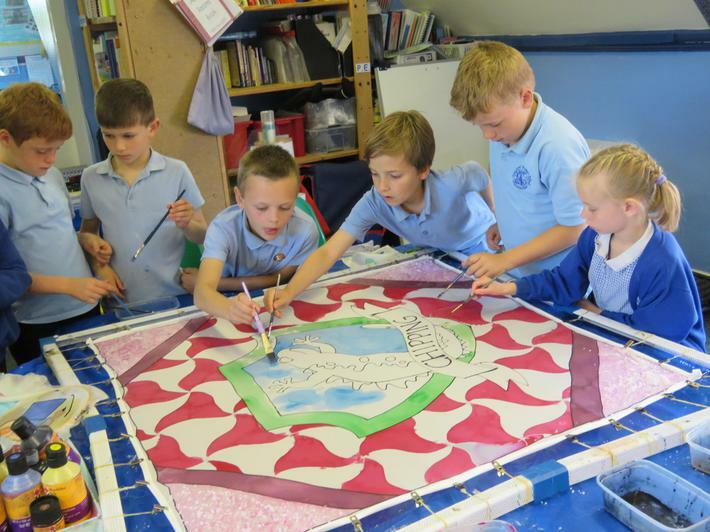 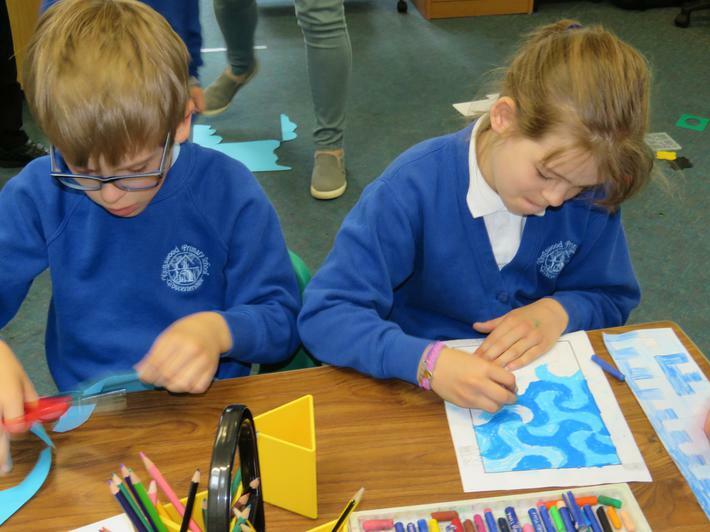 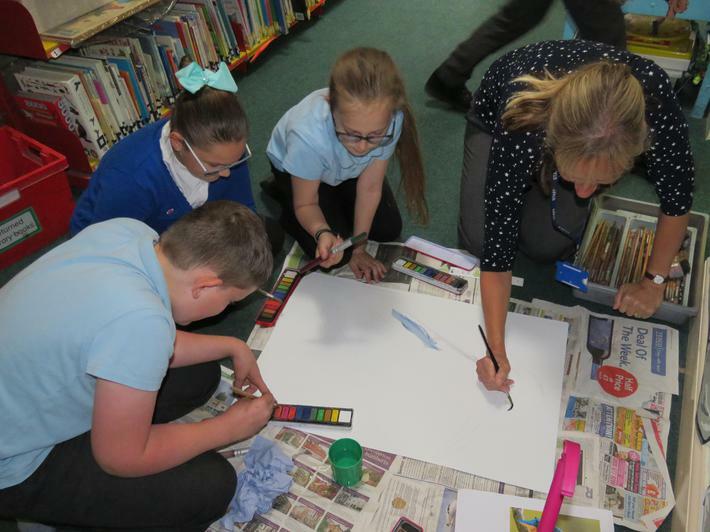 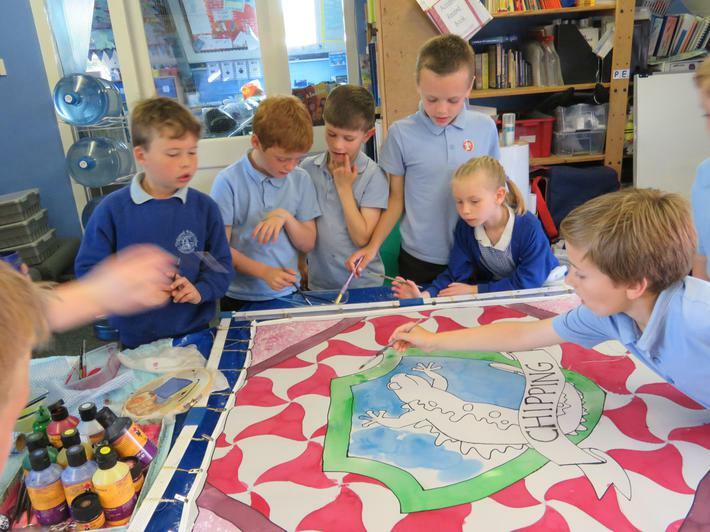 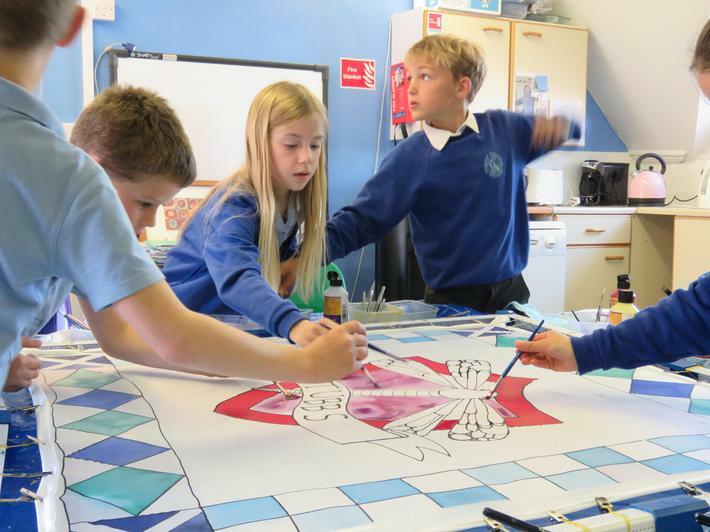 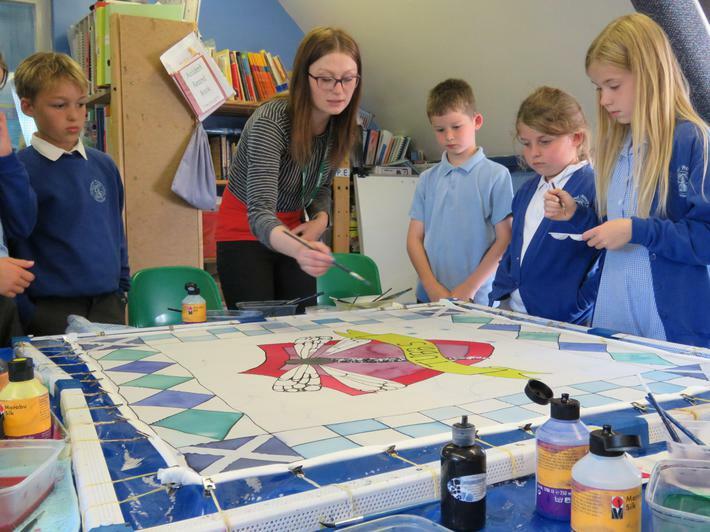 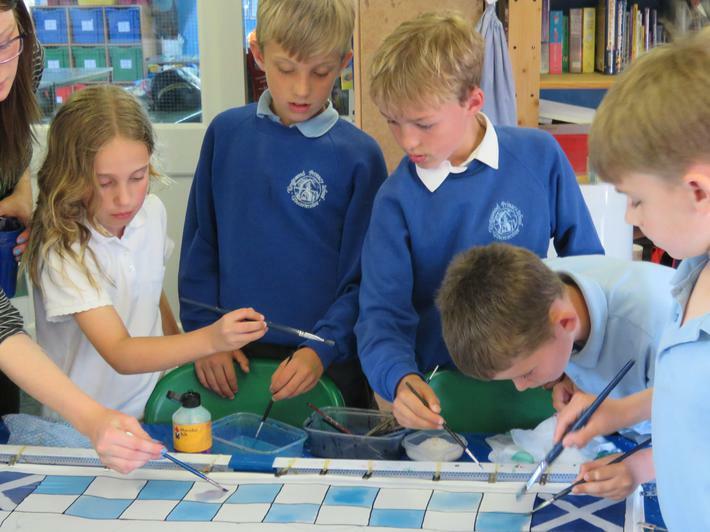 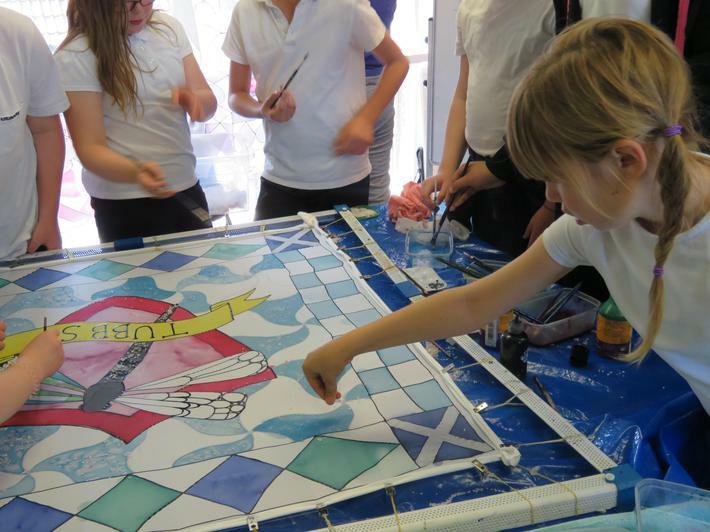 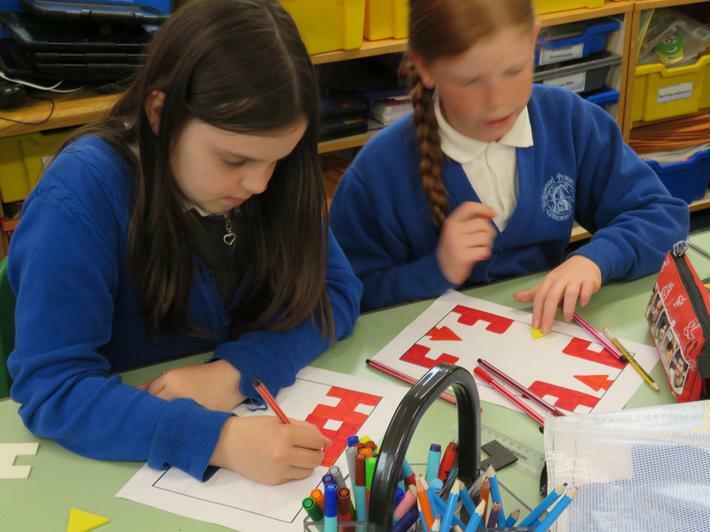 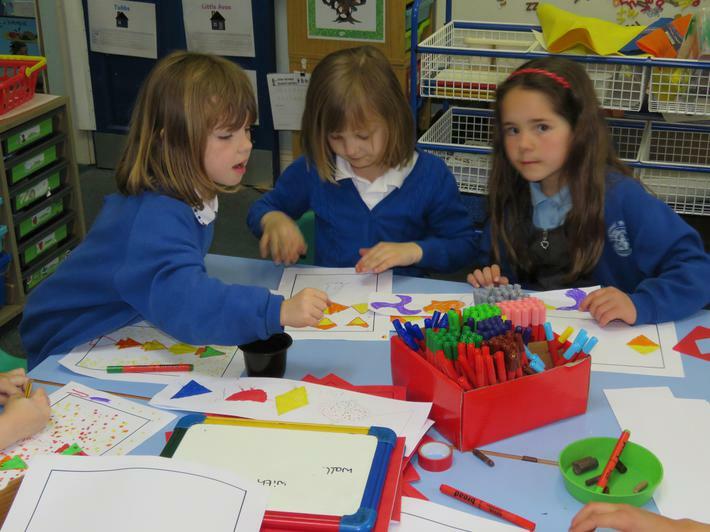 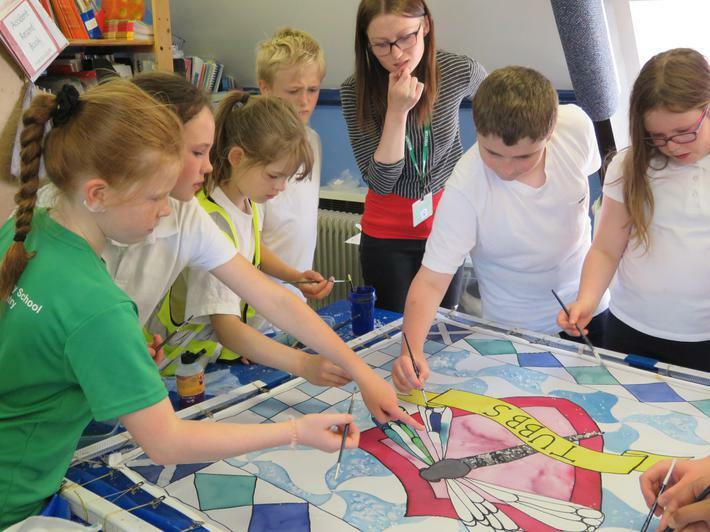 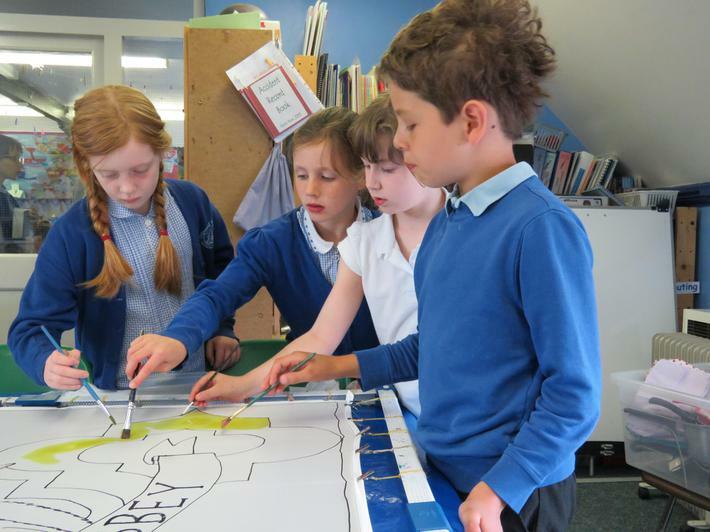 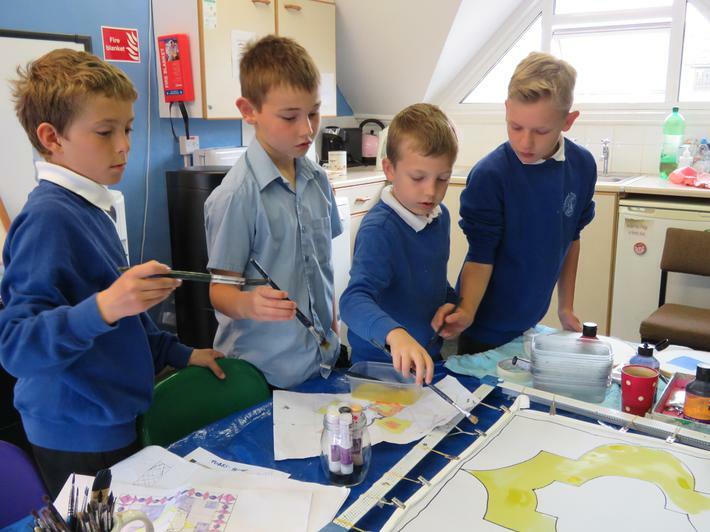 During June we worked with silk-screen painter Nicola Davies, who helped us design and create new flags for the four houses we belong to in school. 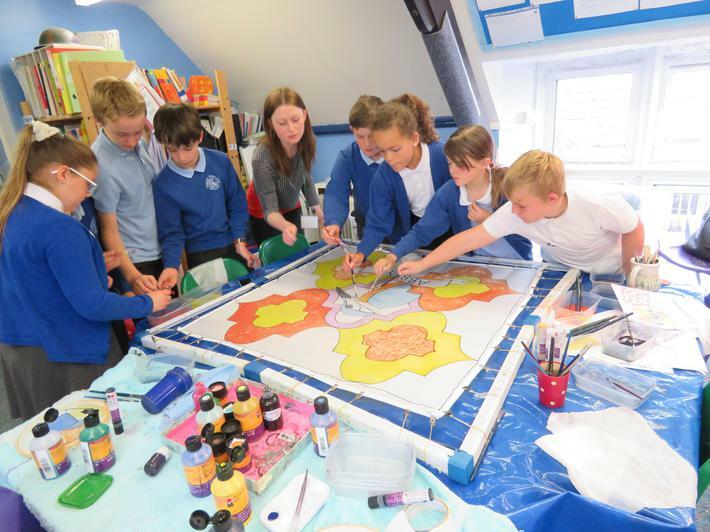 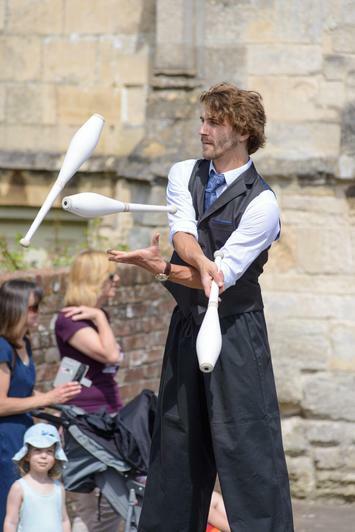 This was part of our 125th anniversary celebrations, alongside the project "Take One Picture", organised by the National Gallery in London. 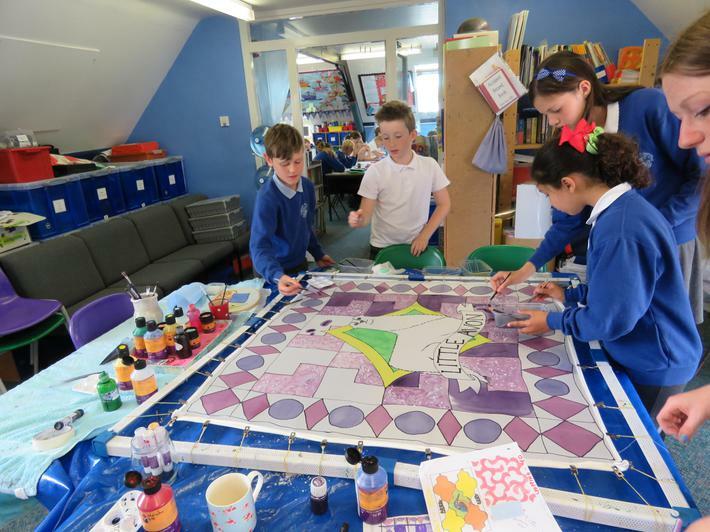 Our inspiration was the painting "Penelope and the Suitors" by Sienese artist, Pintoricchio, which shows an episode from the story of the Greek hero, Odysseus. 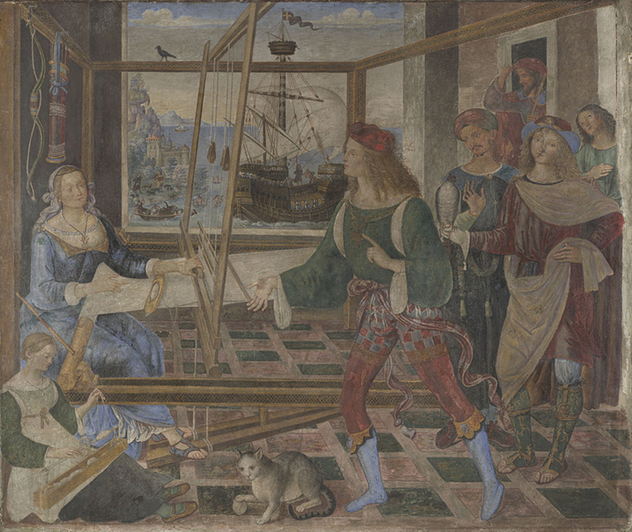 In the painting, Odysseus' wife, Penelope, is shown playing a trick on suitors who wish to marry her (thinking Odysseus is dead, having been away at war for twenty years). 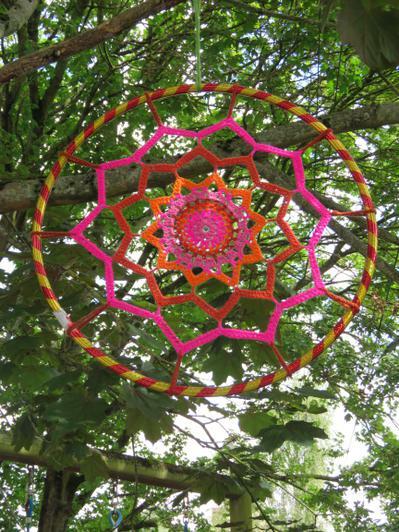 She weaves a garment on a loom, which she then unpicks each night - refusing to marry any of then until she finishes making the cloth. 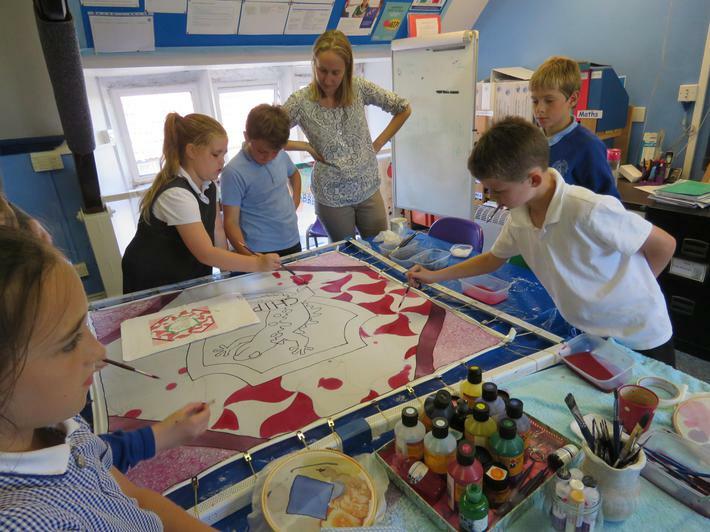 The background of the painting shows episodes of Odysseus' long journey back to his wife and home. 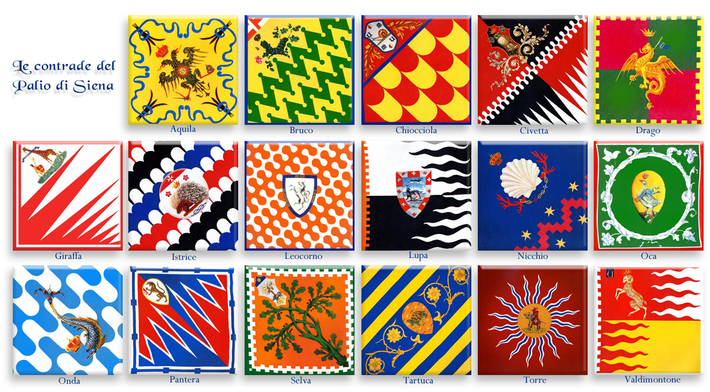 We took inspiration from the style of costume and the flags in the painting which was based on the painter's home town, Siena, where a horse race in medieval costume, called the Palio, is held twice each year. 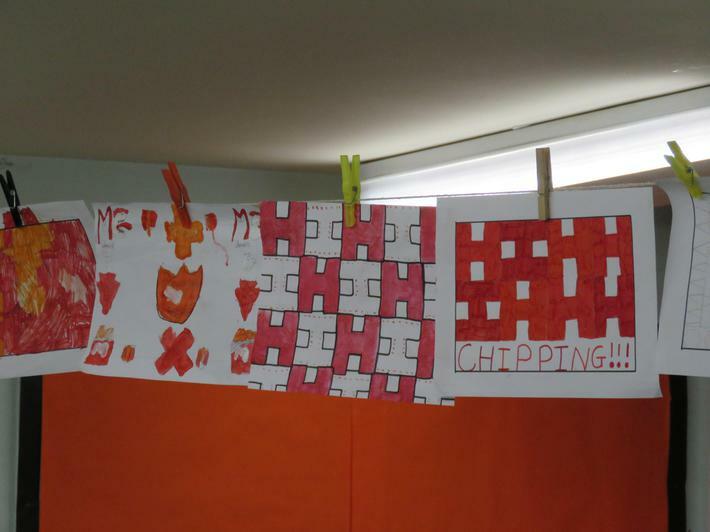 The different districts of the city have flags showing their mascot (an animal) and a geometric design. 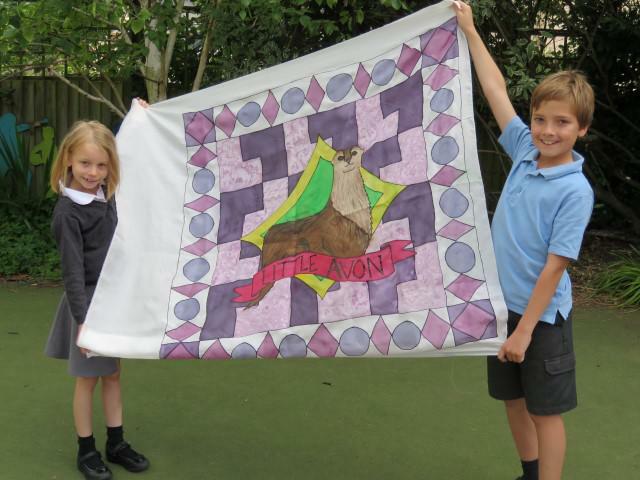 Nicola took our designs and helped us create silk flags from these. 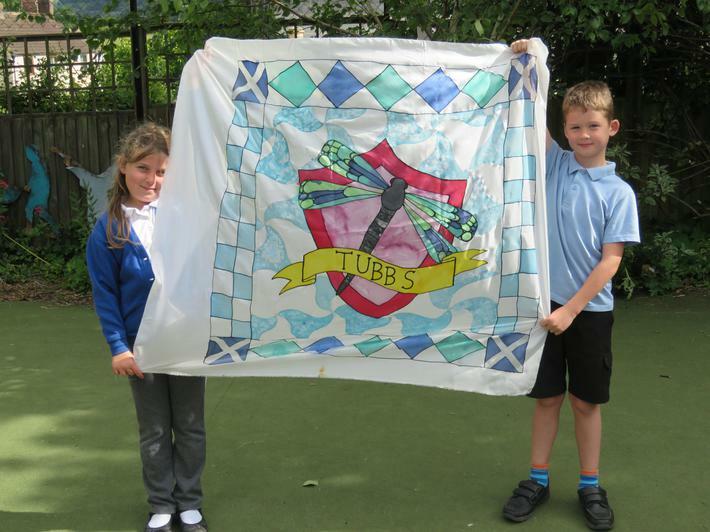 Many thanks to Nicola for her help creating these wonderful flags which we will treasure and use in the years to come. 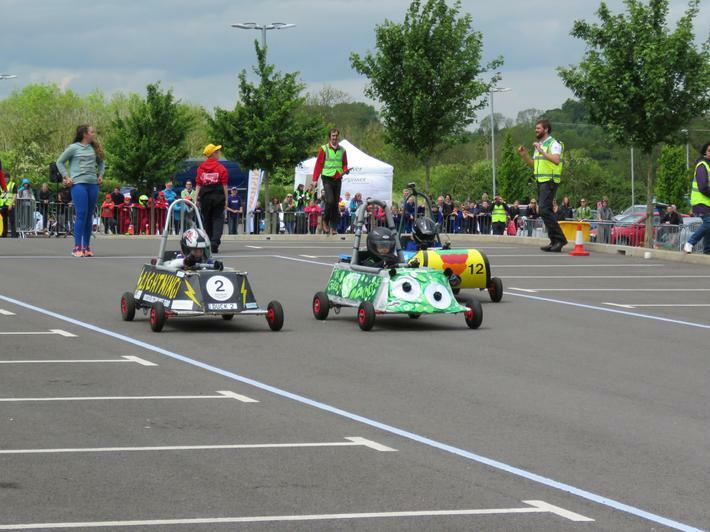 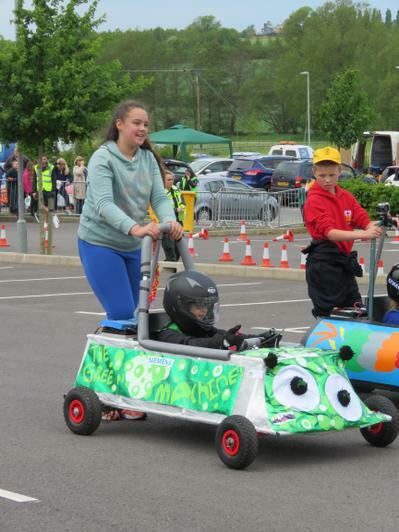 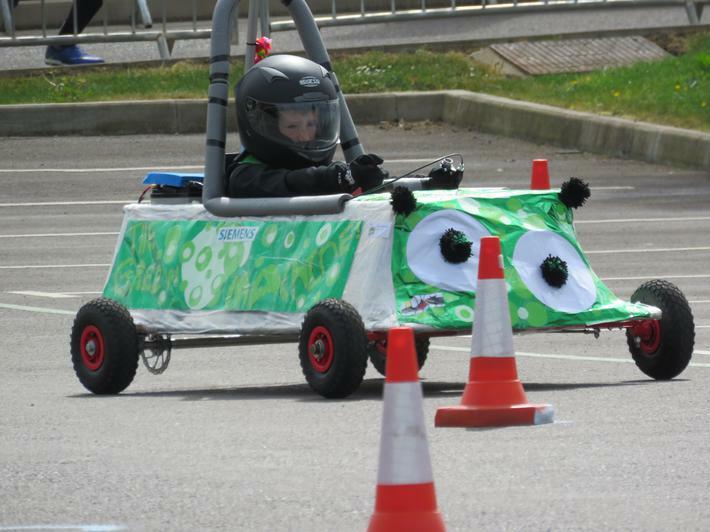 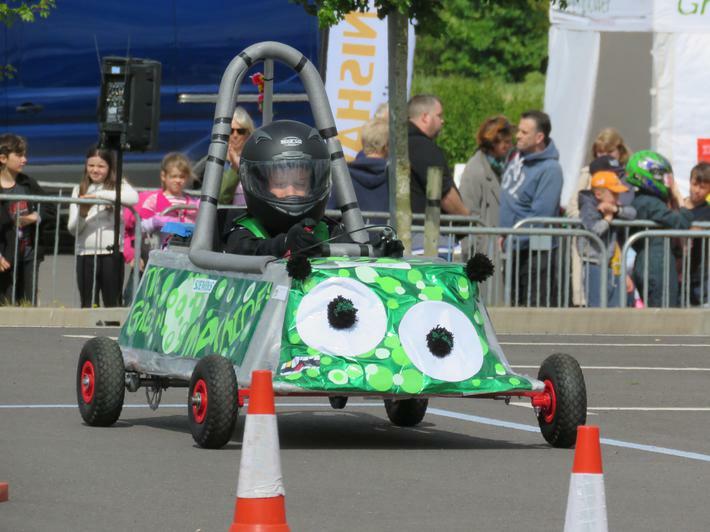 On Saturday 13th May we took part in the annual go-kart competition in the grounds of Renishaw Engineering. 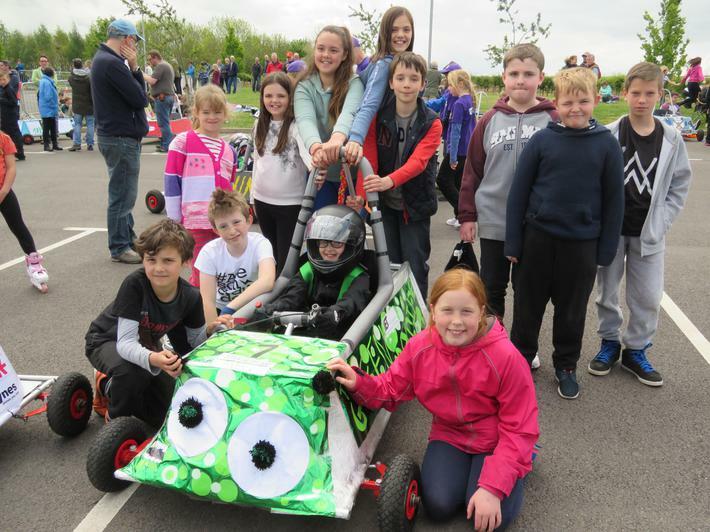 Having constructed and decorated our go-kart we took part in events involving speed trails, slalom courses and inter-school races. 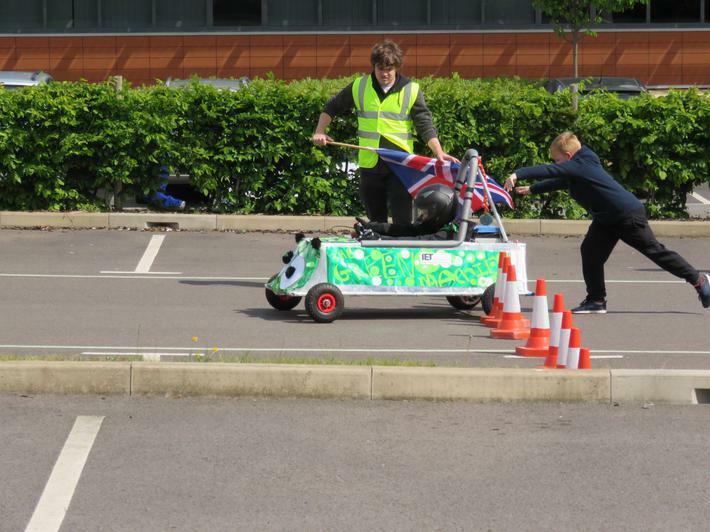 A great day was had by all and we were very pleased to achieve second place in the slalom event. 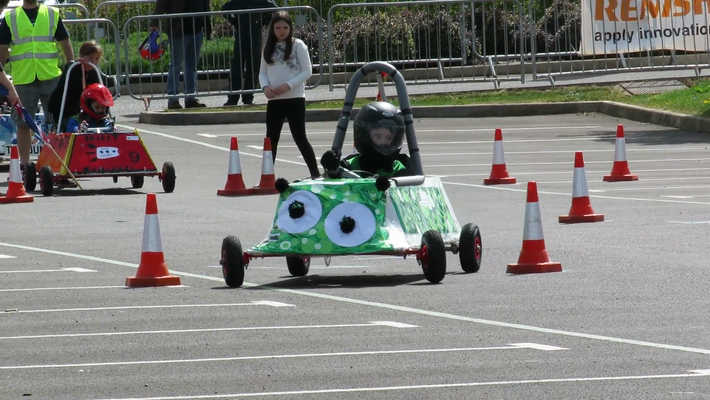 Many thanks to all of the staff and parent who came to support our team "The Green Machine"! 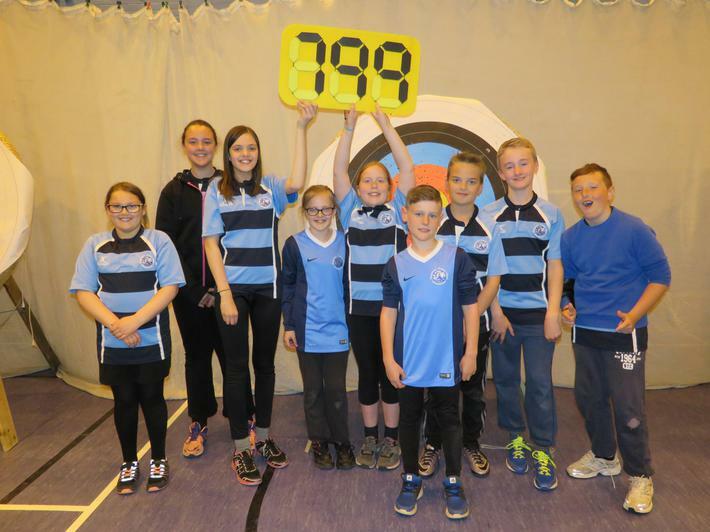 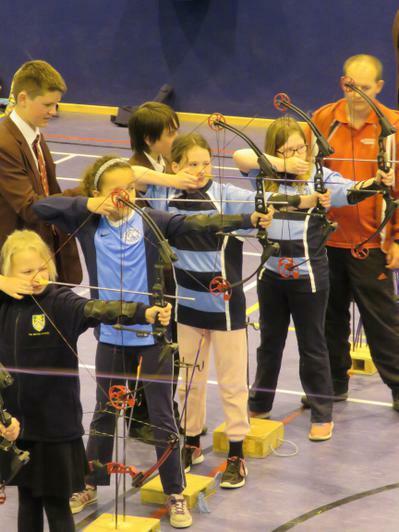 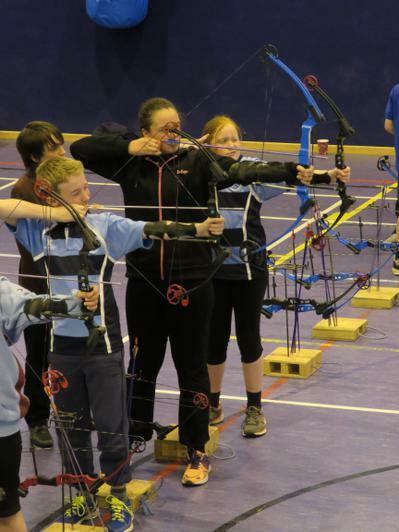 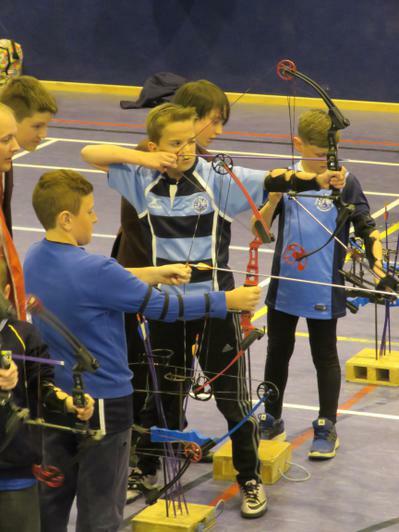 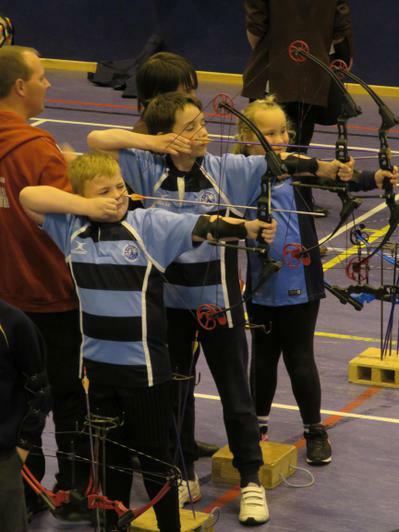 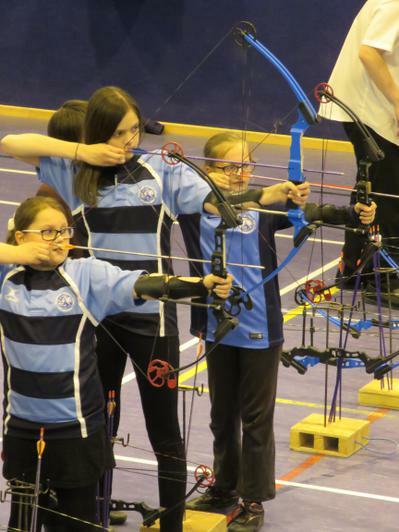 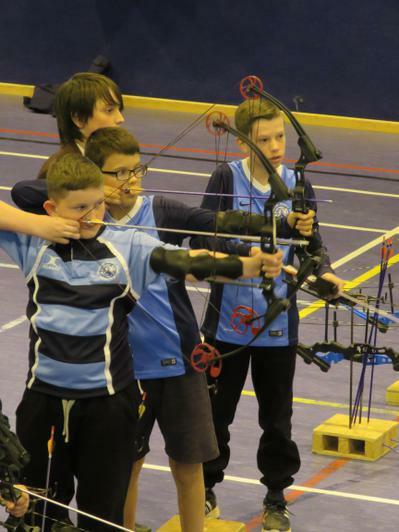 In April 2017 some of our Year 5 and 6 children took part in an archery coaching session at KLB school, followed by a competition. 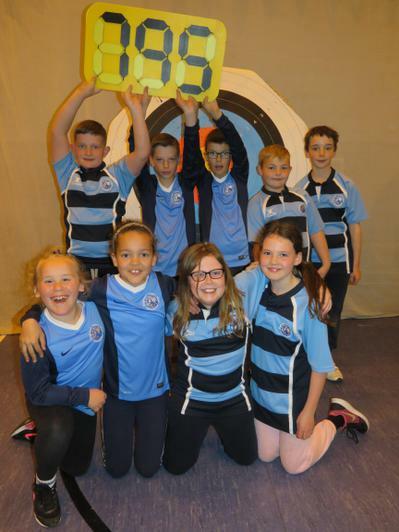 They performed brilliantly and came 2nd and 3rd out of all of the schools involved, showing great team spirit and sportsmanship.